The ECSEPA Team showcased our work at the Joint Research Institutes in Cyber Security Annual Showcase Event held on 17th October 2017 in London. 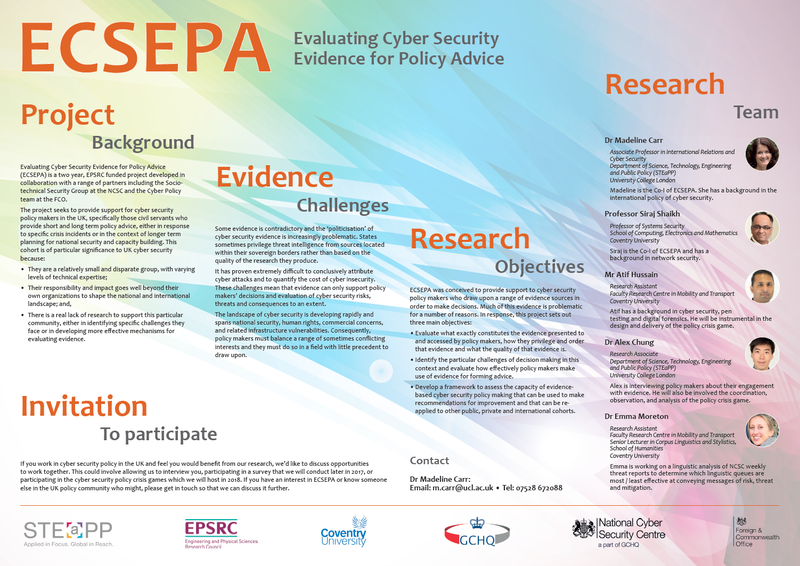 The Mapping Exercise is an extension of the EPSRC funded project, ‘Evaluating Cyber Security Evidence for Policy Advice’ (ECSEPA). It is a five-month project funded through the Research Institute in the Science of Cyber Security (RISCS). The project seeks to map out the complex, rapidly developing UK cybersecurity policy landscape in order to understand, from an organisational angle, how to optimise effectiveness in governance and efficiency in service delivery. This involves developing clarity about how cyber security is organised within HMG – for example, where cyber security policy is being developed and implemented, how different issue bases interact and coincide, where there is duplication, and where there are gaps. ECSEPA – The Other Human Dimension is part of RISCS (Research Institute in Scheme of Cyber Security) Phase 2 that was launched in August 2016.